What are the Legal Aspects of Getting Married? Marriage is a time for celebration and love, but it is also a time that can seem stressful. There are many aspects that couples must consider before marriage, both legal and otherwise. 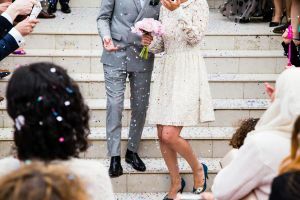 A wedding is an opportunity for a couple to confirm their love for one another in front of their family and friends, but a marriage license is what makes their union legal. A marriage certificate must be acquired in order for a marriage to be legal. To obtain a marriage license visit your local County Clerk. Information about obtaining a marriage license in the state of Florida can be found at the Florida Department of Health website. What Questions Should I Ask Before Marriage? Who will take whose last name? What are my partner’s thoughts on raising children? What are Pre/Postnuptial Agreements, and Do I Need Them in My Marriage? Specifies each party’s assets, debts, and rights before marriage. Determines amount of spousal support, dissolution of assets if the marriage ends. In event of a spouse’s death it distributes his or her estate according to their wishes. Postnuptial agreements are very similar to prenuptial agreements in that each spouse still enters into a written agreement that determines what financial obligations and/or assets each spouse will receive or retain should the marriage end in dissolution. The only difference is that this written agreement is made after the couple has already been married. Also, each partner is privy to more specific information about each other’s assets in a postnuptial agreement than in a prenuptial agreement. Planning a marriage can seem like a difficult enough task and adding the legal aspects of what a marriage entails can make it a very strenuous process. Sometimes you need the help of an experienced marriage attorney to sort it all out. The expert family attorneys at Coye Law Firm are experienced with Florida, New York, Michigan, and District of Columbia law and are here to help.